JStik, JStamp and SaJe - what's the difference? And what about TStik and SNAP? JStamp, JStik and SaJe	are all high speed native-execution modules based on the aJile 32-bit core. JStik has a 32-bit wide data path to external memory (vs JStamp's 8-bit path) so it can fetch opcodes and data in one cycle. This makes JStik 4-5X faster than JStamp at the same clock rate. SaJe also has 32-bit wide external memory and has higher speed SRAM so it's access to SRAM is about 20% faster than JStik. When accessing flash SaJe and JStik are the same speed. All these systems are highly deterministic and are excellent for hard realtime control. TStik is based on a much lower cost 8-bit 8051 super core, the Dallas/Maxim DS80C400. TStik executes an interpreted JVM, so it is significantly slower than native-execution systems -- but it also costs less. TStik hits an unbeatable cost/performance point - for about the same price as a PIC-based Javelin you get megabytes more memory, real Java support, ethernet, CAN, and a lot more. But - don't use TStik for hard realtime control. SNAP fits between TStik and JStik in terms of cost and performance. Which is best for me? It depends on your needs of course, but here is our general answer to this common question: Best overall value: TStik. Best for battery operation: JStamp. Best realtime performance: JStik or SaJe. Best for fitting an existing BASIC stamp socket: Javelin. Best performance upgrade for an existing TINI SIMM72 socket: SNAP. Best for robotics: JStamp. Best floating point performance: JStik or SaJe. note1: TINI uses all but 64K of its flash for the firmware JVM. You can store one Java program in the remaining flash. It is also possible to extend the flash off-TINI -- for example our STEP+ board has an external flash socket. note2: JStamp and JStik run on 3.3V internally, and have an onboard switching regulator. JStamp and JStik can be powered with either 3.3V regulated or 5-14 VDC unregulated. 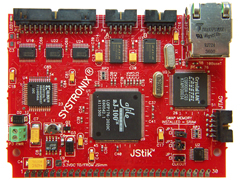 JStik can power its RS232 level shifters and parallel I/O port buffers with 5V or 3.3V. JSimm pin 5 is the optional 3.3 VDC power input or output pin. If you provide 5-14VDC to JStamp or JStik, they provide 3.3V at 100 mA for your external use. note4: TINI applications typically reside in SRAM. SRAM is also shared by the heap and file system. Only 64 KBytes of TINI390 flash is available for user program or data. note 6: aJile controllers native instruction set is Java, therefore Java is its "assembly code" so high speed native methods are written in Java! note 7: See the JIR project at SourceForge. IrDA adapter hardware is required for all systems. note 8: PsiNaptic released JMatos™ software for TINI in 2001 but the current free releases are lagging several months behind TINI firmware releases. A release is possible, but not currently available, for J2ME/CLDC such as JStik and SaJe. JMatos is available for multiple platfroms, but PsiNaptic would rather include it as part of a licensed release optimized for your specific needs. Contact them at their website for the latest details.